Photo of the Vietnam News Agency reporter Dinh Huu Du. A Vietnam News Agency reporter who went missing while covering ravaging floods in northern Vietnam earlier this week was found dead on Friday, rescuers said. On October 11, Dinh Huu Du was standing on a local bridge to film the flood in Nghia Lo Town, Yen Bai Province, when parts of the structure suddenly collapsed, sending him down. The Vietnam News Agency reporter was immediately swept away by the flood and has since been unaccounted for until Friday. His colleague, Pham The Duyet, managed to leave the bridge just before its collapse. Du’s body was found at Van Phu Bridge in the provincial capital of Yen Bai, some 100 kilometers away from his last seen location, according to local rescuers. 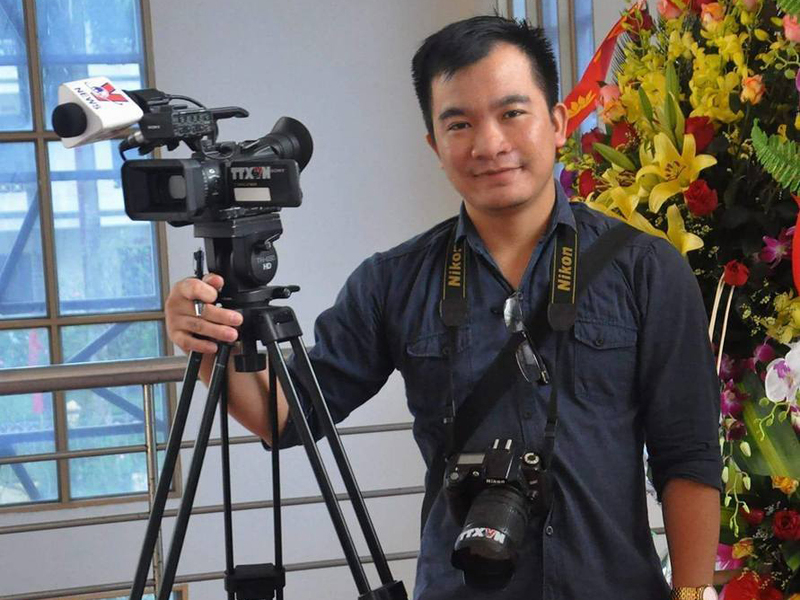 The body of the unfortunate reporter was transported later the same day to his hometown in Ninh Binh Province where a funeral will soon be held. In response to the tragic incident, Thuan Huu, president of the Vietnam Press Association, have sent his condolences to the family of the deceased reporter. The association has also awarded Du with a certificate to honor his courageous spirit working in the field. On Friday, Tuoi Tre (Youth) newspaper also posthumously awarded Du the “Companion Around Me” award, along with VND10 million (US$440). Tuoi Tre gives the award to honor individuals who contribute to society and community. Dinh Huu Du was born in 1988 in the northern province of Ninh Binh. He graduated with a major in journalism from the Academy of Journalism and Communication in 2011. Du became a member of the Communist Party of Vietnam while being a student.